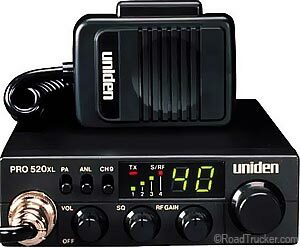 The Uniden PRO-520XL CB radio is a compact, reliable, and rugged radio unit for professional truckers. Front controls include Volume and Squelch Controls, PA, ANL, LED Channel Display and S/RF Meter. Standard 4-pin microphone input is located in front. Meter displays Signal Strength transmission and reception. Back of the radio has PA and External Speaker outputs.